Martin Gayford interviews painter Wayne Thiebaud on the occasion of Thiebaud's recent exhibiton at White Cube, London. Thiebaud remarks: "‘I’d been working in food, washing dishes. That was my environment. I remember seeing pies laid out, processed food that I’d worked on, so I started painting these triangles and turning them into pies. I thought, “My God! I’m done in! Nobody will ever take me seriously!” Then I found I couldn’t leave it alone, it was so real to me.’ ... It’s true that Thiebaud is not a Pop artist. 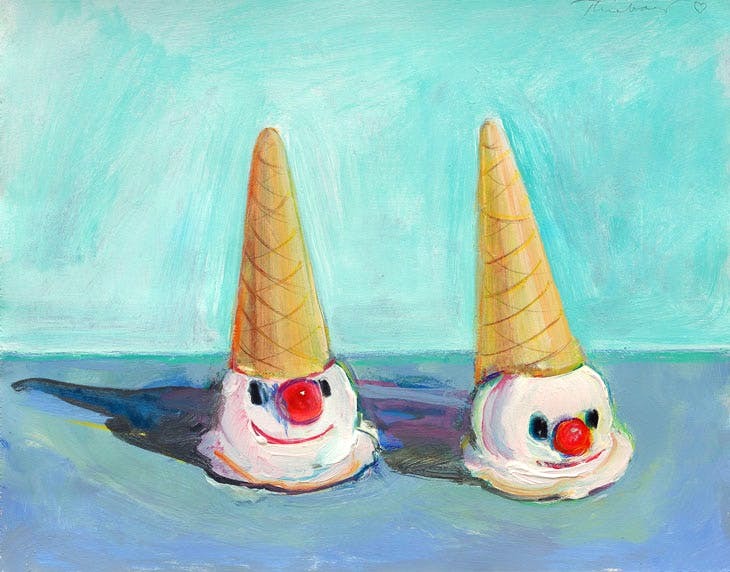 Nor, he protests, is he a ‘realist’: ‘I don’t have much to do with realism; there’s a big difference between realism and representation.’ Despite the sensual, good-enough-to-eat qualities of his still lifes, Thiebaud’s approach is far more formal, almost conceptual, than the word ‘realism’ implies. Those cookies, ice creams, and slices of pie, for example, grew out of exercises in three-dimensional geometry."